HILL COUNTRY and NORTH CENTRAL Texas – People ask why I love prairie, why I love the West as much as I do. I wish I could take a 3D picture for you because I can’t explain “big sky country.” I don’t have the words for storybook clouds that barely move, how the only shade sometimes are the clouds’ shadows on blacktop, how it’s like the ocean in that you can see the curvature of the earth. We have sipped iced tea at a country fair on the Guadeloupe River and had ribs from the place that must have been the genesis of the phrase OMGBBQ!11! We had cilantro ice cream and waited in a drive-through lineup for half an hour for a Texas-size donut as big as Trevor’s head. We went on a ghost-town hunt. 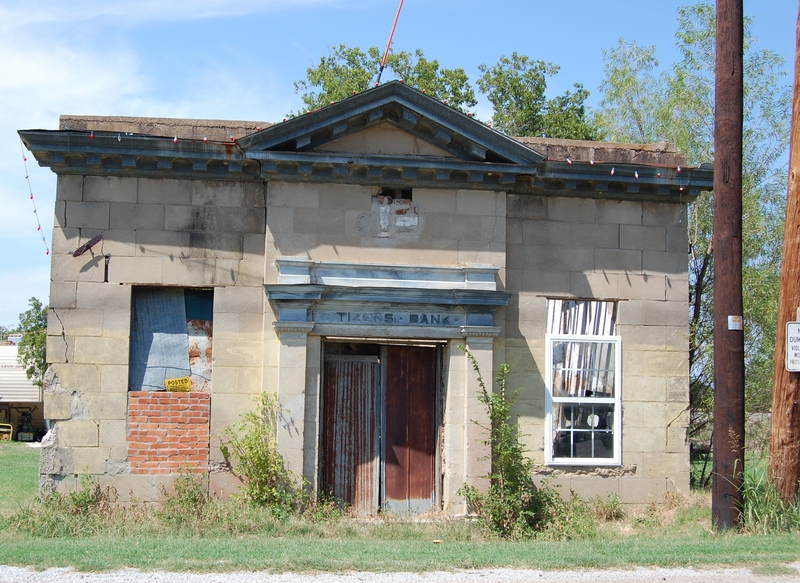 At the first, all that was left was a falling-town bank and, across the railroad track, a subdivision we think was built over the rest of the foundations and the cemetery. At the second, we snapped shots of a church and graveyard and were escorted off the property by a couple of tire-happy farm dogs. In Luckenbach, a cowboy said “Howdy!” – he really did. I love Texas. I can’t explain it, and I’m going to stop trying. We’re on our way north again, north and home by the end of the week.